It could be any year, but the year is 1907, 97 years ago, and P. D. Ouspensky, journalist for the Moscow daily paper The Morning, must write an article on the Hague Conference, which preceded the First World War. I have just received the foreign papers, and I have to write an article on the forthcoming Conference. Phrases, phrases, sympathetic, critical, ironical, blatant, pompous, lying and, worst of all, utterly automatic, phrases which have been used a thousand times and will be used again on entirely different, perhaps contradictory, occasions.... What is the use of attempting to expose lies when people like them and live in them? It is their own affair. But I am tired of lying. There are enough lies without mine. 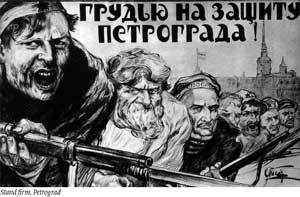 When power got into the hands of the Bolsheviks, which was a very small and despised party, all evolution stopped. In the last twenty years Russia has produced not a single book, not a single picture. If there are people who write or paint there, they are people who have been doing it before the revolution. And I saw what happened. I saw what an enormous progress Russia had made in the twenty years preceding the revolutionit was quite a different country; literature, art, everything was developing rapidly. And now all this has stopped. At the same time there are plenty of words and promises.... There is nothing worse than war. But one must make a distinction between those who are responsible for war and simple participation in war. A soldier taking part in a war is not a criminal.... What particularly makes them criminals is spying, lies and pretence. They pretend that they have cultured aims. Actually it is all simply paid propaganda. So it was then, so it is now and will always be. It is not true that you cannot fool people endlessly. As the German Field Marshal Herman Goering explained at the Nuremburg trials before poisoning himself, one simply has to create an external threat and cast all dissenters as unpatriotic or worse. "It was a good ride," he chortled when captured, having thrown lavish parties at his castle right up to that moment. Millions upon millions dead, whole cities bombed to the ground, and for what? To stop communism and spread fascism, trying to turn back the clock on what was seen as the disease of decadence and mercantilism and create the Thousand Year Reich. In the end, neither fascism nor communism ultimately won out but rather what one might call democratic capitalism. Now rising to challenge this view of the world are what are called militant Islamic extremists. The West sees it as a war of terrorism; Osama Bin Laden sees it as a defense of Islam. What is behind this conflict? Well, one could argue that it is the final willing out of an age-old historic confrontation that began with the Crusades of the Middle Ages. But if so, why is it happening now. Two reasons, perhaps. Because it can happen. And because of technology. It is the pervasive power of technologywhat the philosopher Martin Heidegger warned about in his prescient The Question of Technologythat is opening up and confronting the Islamic way of life. It isn't that the West means to do so, that is, deliberately seek to undermine Islam. It is more that technology and the globalism it produces (along with a media/Internet/Hollywood confluence of cultural and mercantile sewage) is undermining the Islamic way of life. There are periods in the life of humanity, which generally coincide with the beginning of the fall of cultures and civilizations, when the masses irretrievably lose their reason and begin to destroy everything that has been created by centuries and millenniums of culture. Such periods of mass madness, often coinciding with geological cataclysms, climatic changes, and similar phenomena of a planetary character, release a very great quantity of the matter of knowledge.